One of the lowest-priced forms of livestock feed, beet pulp is what is left over from processing the sugar from melon-size sugar beets. Available as shreds or pellets, beet pulp can stretch your feed budget, but they should not serve as the sole source of food for your chickens. Beet pulp swells dramatically when you add water, so prepare the food at least 30 minutes before feeding it to your flock. Mix 1 part water for each part shreds or pellets and allow the mix to sit until the moisture absorb. Break apart with a fork and serve in a pan. You can mix in vegetable peels, scraps, feed pellets and scratch, but serve only as much as your chickens will eat immediately, to avoid fermentation. According to a study by the Poultry Science Association, laying hens who had their corn ration replaced with beet pulp by more than 10 percent experienced significant reduction in egg production. 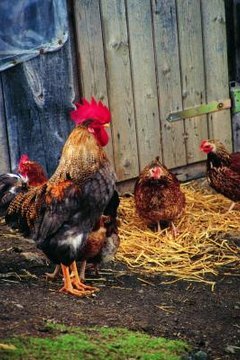 The hens also lost body weight on the diet, although the size and weight of their eggs were not affected. While beet pulp will not harm your laying hens, the low energy provided by it is not sufficient to meet the requirements for ideal egg output. In a separate study, the Swedish University of Agricultural Sciences and Polytechnic University in Madrid, Spain, determined that feeding broiler chicks beet pulp during the first 21 days of life increased body weight and resulted in a better feed conversion ratio than chicks fed on maize. While chickens were heavier than their corn-fed counterparts, the yield of meat in legs and breasts were similar, with weight increased in the gizzard and intestines. Beet pulp can help save feed costs by mixing it with regular ration, especially over winter when egg output and other energy expenditures are lower. The pelletized and molasses-added versions tend to be more palatable by chickens, and they provide more energy because of the sugar. However, if you worry about simple sugars in your chicken's diet, you can introduce them by mixing the sweetened and unsweetened half-and-half and gradually increasing the ratio of sugarless pulp.